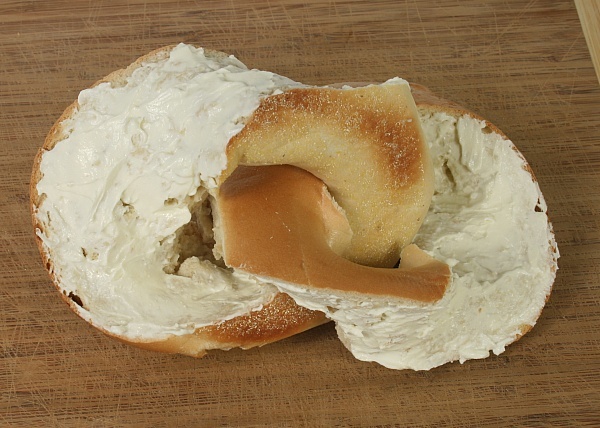 Start your day right by making this challenging bagel cut, and see if you are really awake yet. Can you figure out how to slice a bagel into two congruent halves which pass through each other’s holes, like two links of a chain? Hint: The motion of the knife follows the surface of a two-twist Möbius strip. If you hack up a dozen bagels without solving this puzzle, you can check out the instructions here. This is the first in a new series of Math Monday posts coming from the newly formed Museum of Mathematics. Look for a cool math-related construction each Monday! This article first appeared on Make: Online, December 7, 2009.